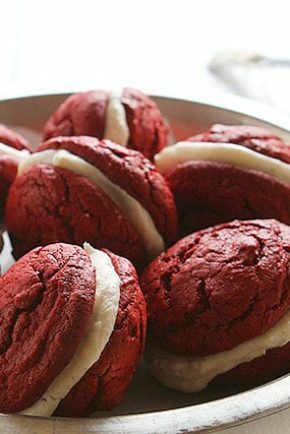 Creating a fun and festive dessert for Christmas doesn’t have to take forever! 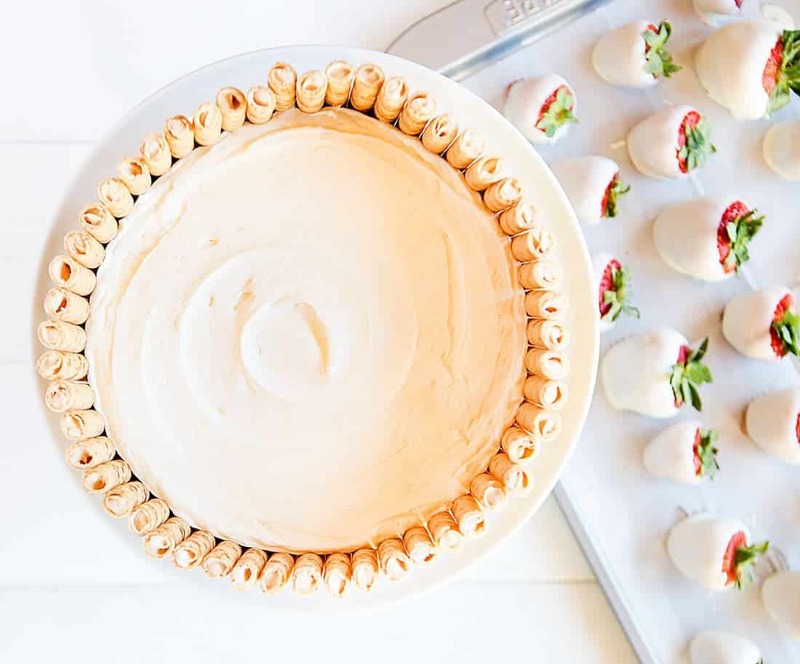 All you need is store-bought puff pastry and a jar of chocolate hazelnut spread and you have a show-stopping treat that everyone will love! 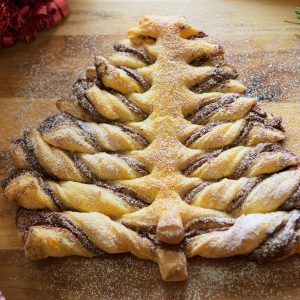 Spread chocolate hazelnut spread over the puff pastry in a tree shape. Sprinkle the chocolate hazelnut spread with cinnamon. Place the other layer of puff pastry over the chocolate hazelnut spread and flatten with your hands. Gently with your fingers try to feel the outline of where the chocolate hazelnut spread is. Carefully begin cutting along the edges with a sharp knife. Remove the excess pastry. At the base of the tree carefully cut away two strips either side to form the base of the tree trunk. Pressing the knife blade rather than slicing, begin cutting the pastry to form the branches, following the line of the trunk and getting narrower the further up they go. The tree "branches" are now ready for twisting. 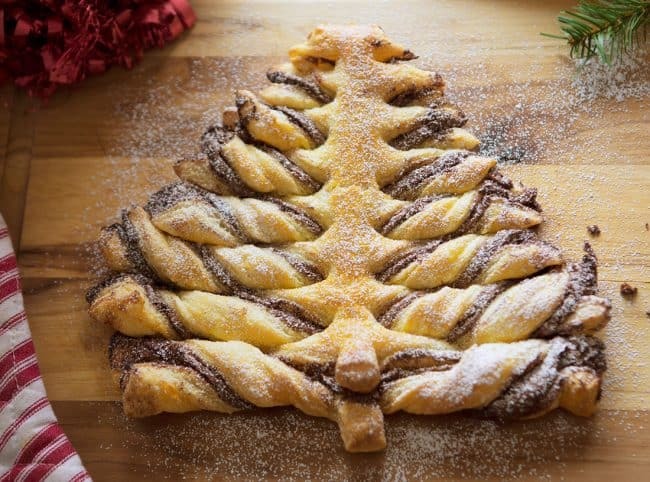 Beginning at the base, twist the pastry away from you, trying to get in at least two turns on the lower branches. You may need to clean your hand between each twist as the chocolate hazelnut spread can get messy. Continue moving up the tree, twisting away from you as you go. Brush the star and tree with lightly beaten egg. Bake in a 350 degree F oven for 18-22 minutes, or until risen and golden brown. Dust the tree with powdered sugar. 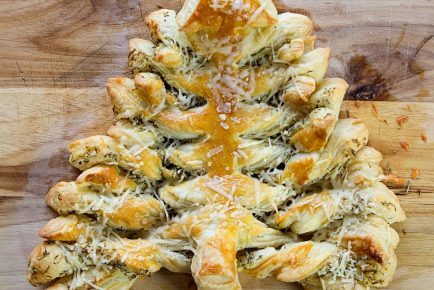 I actually made two versions of a puff pastry Christmas tree, one sweet and one savory. Head over here to get my Bacon & Rosemary Puff Pastry recipe! I hope you love this Cinnamon Chocolate Hazelnut Puff Pastry as much as we did! So beautiful Cinnamon Chocolate Hazelnut Christmas Tree! So inviting ! Thank you and have a pleasant holidays ! I made this for Christmas morning breakfast and it was a hit with all of the family – thanks for the recipe! I love this idea, but I absolutely can’t stand Nutella. I was wondering what other types of fillings can go with this. My husband is allergic to nuts, so I can not use Nutella. How can I make a nut-free chocolate spread or what can I purchase to use as a substitute? Thanks! Yes, you can use a nut-free spread! 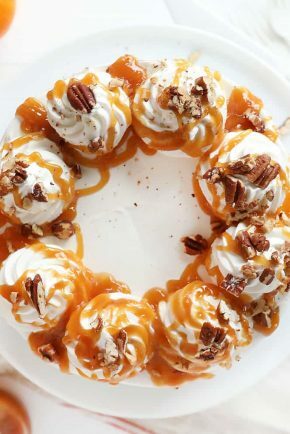 I really want to make this, but we are not hazelnut fans. Is there another suitable filling one could use? 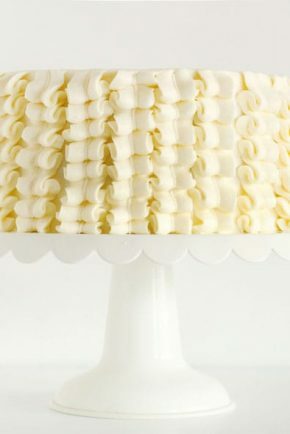 this was so easy to make and such a huge hit at holiday party! I had a request to make it for the next one we have this weekend! Excellent! 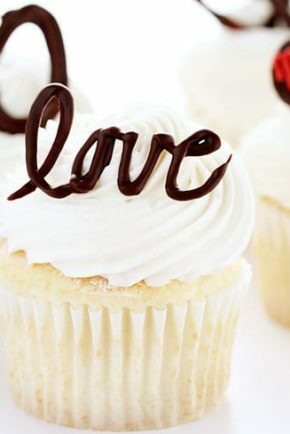 Could I substitute the nutella for chocolate frosting?